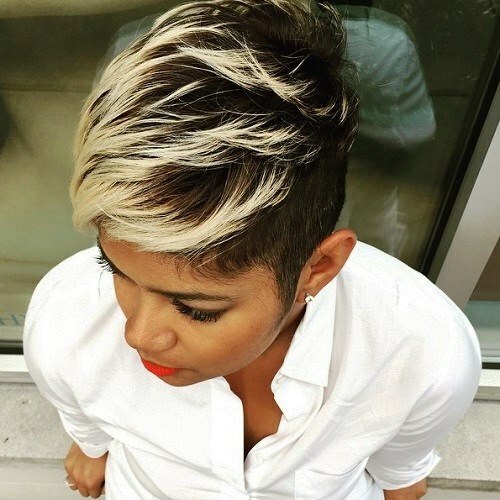 In the era when ladies don’t want to chop the hair because the long hair has become the symbol of feminism, medium cuts provide a midway to enjoy longer length which is still manageable. Furthermore, the addition of bob makes shoulder length elegant yet very less maintenance-requiring styling option. Bob may seem as kind of a straightforward hairdo at first, however, it’s certainly not. It provides a great room to play with the layers’ length, the hair textures, and the hair colors. Thus, such haircuts provide an easy and classy solution to women of every age and class. From teenage girls to working ladies, bobbed cut makes all ready to steal the show with an alluring appearance. From 90’s beauties to today’s fashion symbols, i.e., Elizabeth Taylor, Marilyn Monroe, Claire Danes, Jessica Chastain, and many more embraced the industry with their heartthrob bobbed haircuts. If you are planning to have a makeover, then have a quick look at the below mentioned Medium Length Haircuts which will transform your looks in an eye catching way. This simple yet chic hairdo draws audience’ attention to the cheekbones and eyes. As the famous celebrity stylist Charles Dujic claims “A blunt bob with bangs on a heart shaped face looks great”. 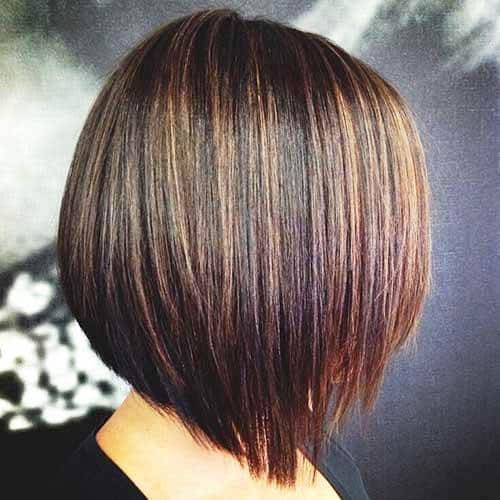 So, by styling it straight and smooth, one can emphasize the bob’s bluntness. To achieve a perfect sleek look, must use a paddle like brush. 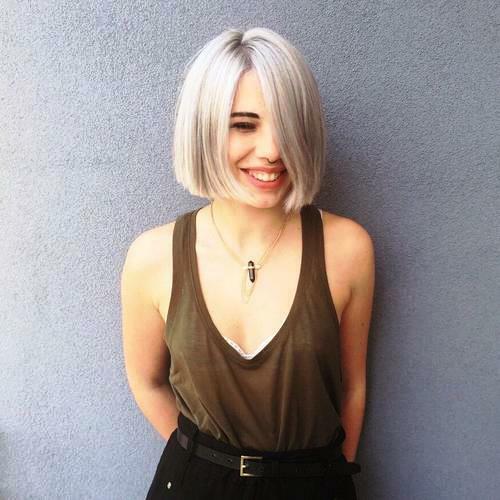 For the girls craving for an overall dimension, this one of the most chic Medium Bob Hairstyles is a must try. Because, it creates a fresh look which is not too extreme or too rigid. A-shaped structure softens and frames the face features, creating a perky finish and youthful look. 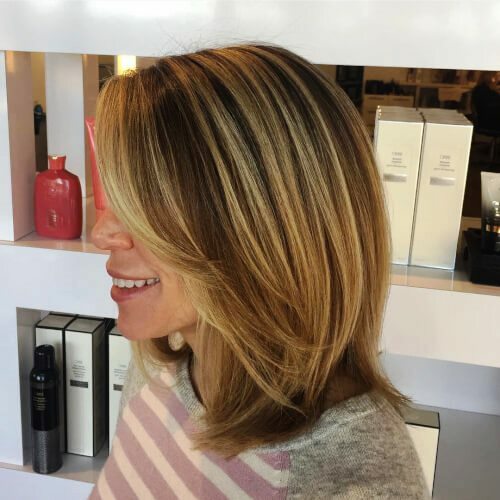 By using highlights of natural color, you can create a perfect summer and spring rocking style. 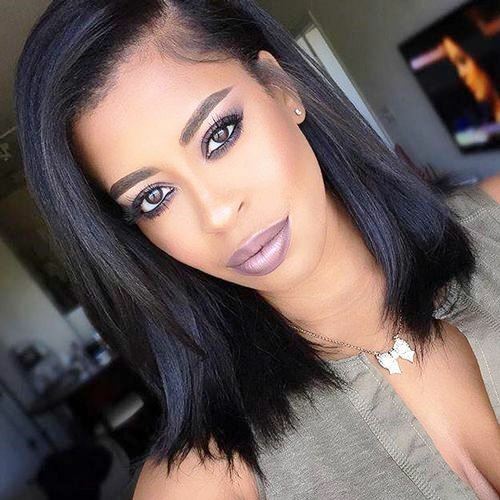 The first look of this Medium Bob Hairstyles is too adorable to handle. 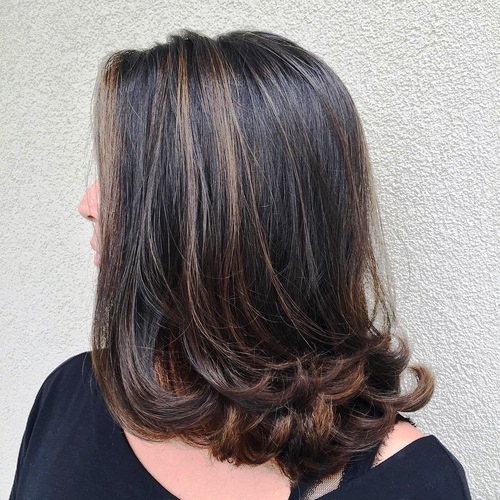 The casual and loose curls with lovely brown highlights accent the personality magnificently. If you want a hairdo which is elegant and coy all at once, then have a keen look at this haircut. Henceforth, all you need is a curling iron and a good hair spray to get an adorable OLALA look! Undoubtedly, asymmetrical blonde bob is not an easy hairdo to carry. It can go wrong if it is left completely sleek with a botched or unfinished appearance. So, to make it look fabulous and edgy, don’t forget to add wavy hair texture and a rocking color dye. Plus, the further addition of a leather jacket with this blonde Medium Bob Hairstyles is enough to uplift your personality for all upcoming club parties! Summer is ahead and are you looking for a hairdo which goes well with this hot weather and your planned beach parties? Then you have landed at a right place. Because sunlight is all set to put life in these glamorous beach waves. Furthermore, mesmerizing platinum blonde dye acts as a cherry on the top. 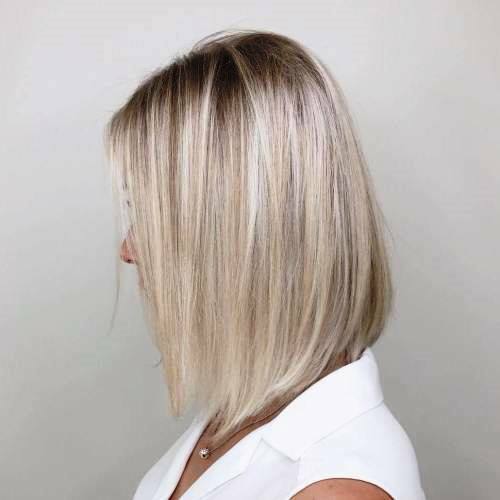 Hence, do not forget to pair this Medium Bob Haircut with short jeans to get an adorable, summery appearance, which will never go unnoticed. 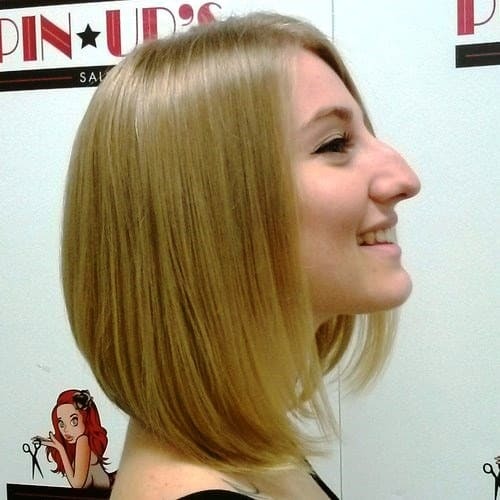 A graduated bob is one of the easiest to carry Medium Bob Hairstyles. It’s bouncy, trendy, and funky. So, there is absolutely no reason not ot opt it. Even in the simplest form, this hairdo with a stacked back and long front can allow any woman to make an alluring style statement. This beautiful hairdo is all ready to give you a perfect Friday night party appearance. 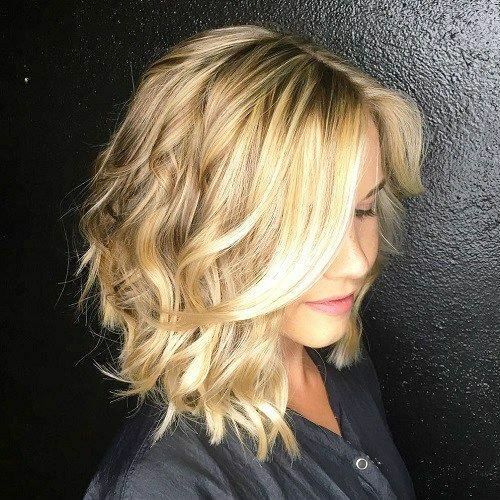 It’s no doubt one of the most decent and sophisticated Medium Bob Hairstyles. By luxurious and loose waves, this extreme A-shaped cut looks perfect. And of course, this is exactly the look you are looking for the upcoming prom night! In early 2000’s, bolder streaks hit the style charts with a messy storm. However, this look still can be rocking today. 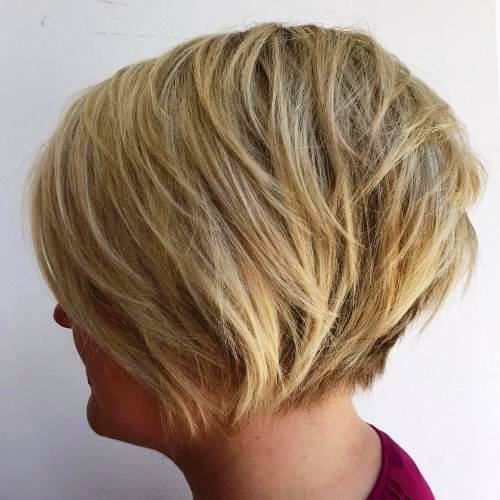 Such bouncy and a lovely Medium Bob Haircut features a graduated blunt bob with stacking to add a voluminous appearance. In fact, it frames the face and imparts an absolutely glamorous look, just perfect for teenage college students! Whenever you tease your hair, you are likely to spend another few minutes to make it appear natural and neat. However, sometimes it’s fine to just leave the teased hair open and exposed. This is what is done in this hairdo. Hence, this teased Medium Bob Hairstyle is trendy, funky, and will do no doubt wonders at any party. 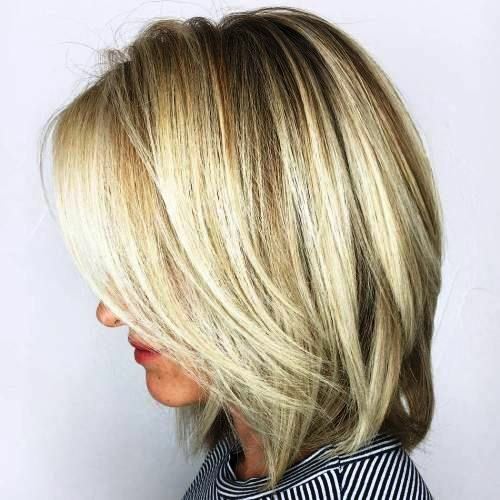 Clearly defined and polished, this particular Medium Bob Haircut is suitable for ladies who want a rigid and a modern look. For a sleek and modernized finish, strands are kept black and white. On the other hand, middle parted style goes well for heart shaped and round faces. Purple is one of the hottest hair dyes, hitting the style charts these days. But if you are not confident enough to take a bold step of coloring your tresses with a vibrant purple color, then consider this trendy idea of sprinkling the purple dye to the platinum blonde roots. And the end result is a very alluring A-line Medium Bob Hairstyle which will turn the heads towards you. This look is simply romantic and stunning. The cut starts from darker roots, leading towards the hints of deep red tresses and lovely curls, adding tons of elegance. This one of the most elegant Medium Bob Hairstyles allows you to rock the shoulder length with a bang! Henceforth, pair it with one of your finest dress to turn the heads in a wedding function or a friend’s party. In the list of super trendy Medium Bob Haircuts, this hairdo will definitely come in top 10. You can transform your dull, lifeless locks into cute and bouncy ones which look FAB! The addition of a trendy flip to this graduated bob will impart a bouncy boost up which works great for mature ladies. 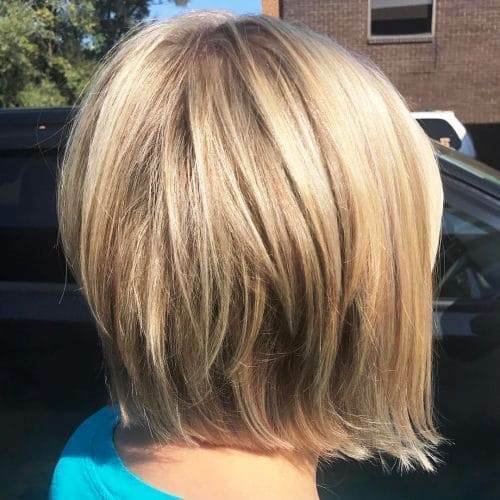 You cannot go wrong with this funky layered Medium Bob Haircut, especially if you own a funky and cute personality to make a match! The quirky layers add tons of youthful bounce and texture to the face, which is extremely eye catching. So, this hairdo is a great option if you are looking for Medium Layered Hairstyles for your next makeover. So soothing and ladylike, this simple yet classic and adorable Medium Bob Hairstyle will make you fall in love. 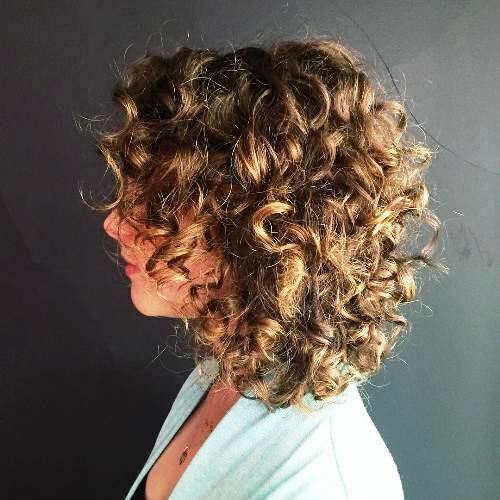 Instead of keeping the basic bob straight and sleek, very delicate curls are added by a curling iron, which are doing wonders. The end result is a flawless polished look that can be opted for any formal or informal event. Don’t forget to use the minimal makeup to allow the natural beauty to do the talking. The first glimpse of this hairdo makes you fall in love with the beautiful gray color. This chic and super polished look allows you to make a style statement that will be stunning for days. 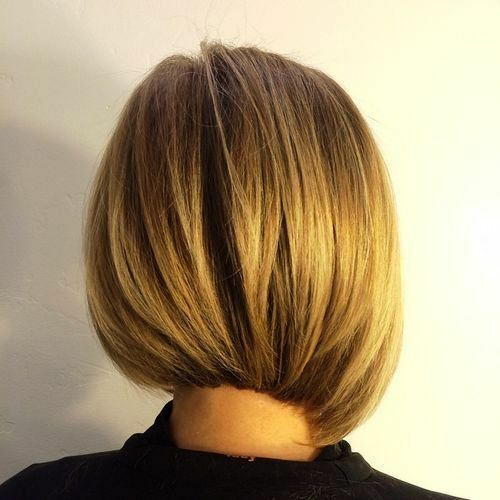 The basic graduated bob is updated with some very short layers on the top half, which add volume and height. Plus, you just further need a dose of confidence pill to rock your every appearance. For school function, for a family trip, for prom, for a date night or for ANYWHERE! Your every appearance can bring life in your looks with this one of the most elegant Medium Bob Haircuts. 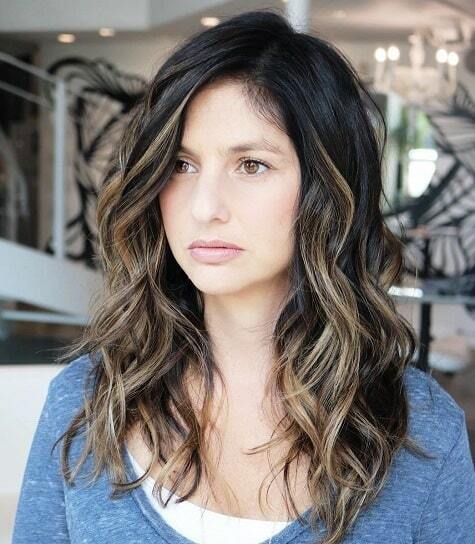 As loose waves and a medium asymmetrical bob make an adorable and sassy combination. Moreover, an addition of a color dye which suits your personality makes it more alluring and eye catching. 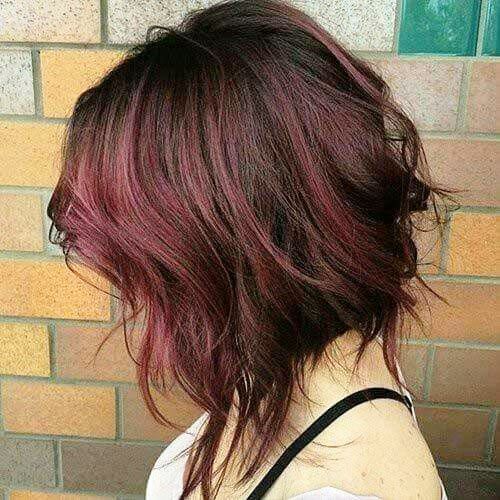 Ombre is such a hot trend these days, and a further blend of intense red dye takes the hotness to another level! A thrilling vibrant red color cascades down towards the jet black hair tips, creating an amazing finish. To further emphasize on the boldness that this one of the boldest Medium Bob Hairstyles possesses, a lot of teasing is applied. Hence, the end result is a voluminous “look-at-me” image! 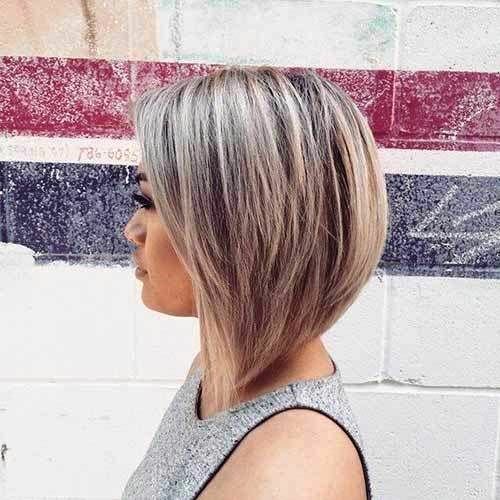 You can take your Medium Bob Haircut to the next style level by adding tons of crazy super short layers, stacking on the back side. This hairdo gives a unique, edgy finish with wild texture. In addition, Blonde highlights may further be added to enhance the dimension of the cut. 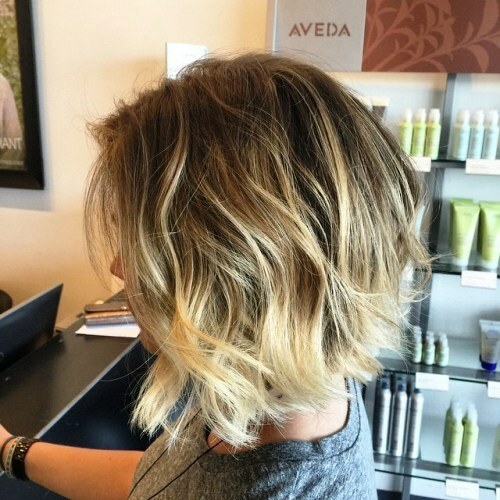 Fun and casual, this messy Medium Bob Hairstyle is such a nice pick for everyday looks. Must wear it on poolside as well as in the schoolyard. The messy style gives a girly touch to the personality, whereas the side swept bang keeps the things innocent and soft. 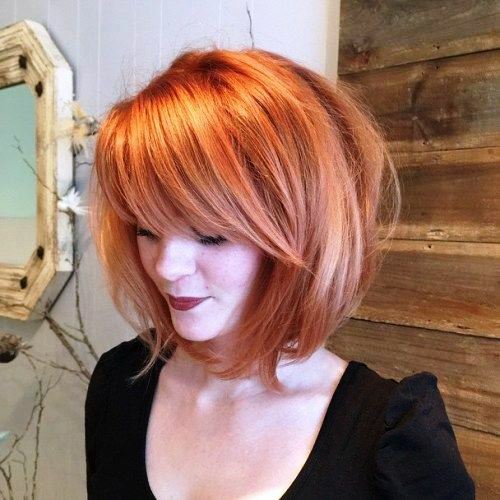 No doubt, this is one of the best Shoulder Length Bob with Bangs, creating a cute feminine look. 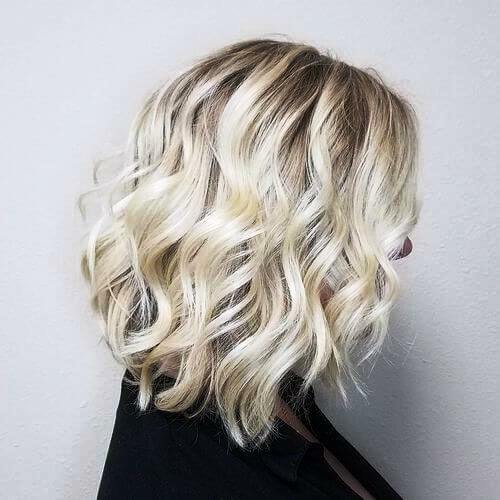 If you are looking for some Mid Length Bob Hairstyles with Fringe, then this hairdo can be a nice inspiration for your next makeover. This cut lies just above your shoulders to create a bouncy effect, whereas the straight fringes impart an alluring lift to the style. Furthermore, for a stylish look a bit of texture is added through teasing, which makes it a perfect “everyday” style! Are you craving to get this model-like look? 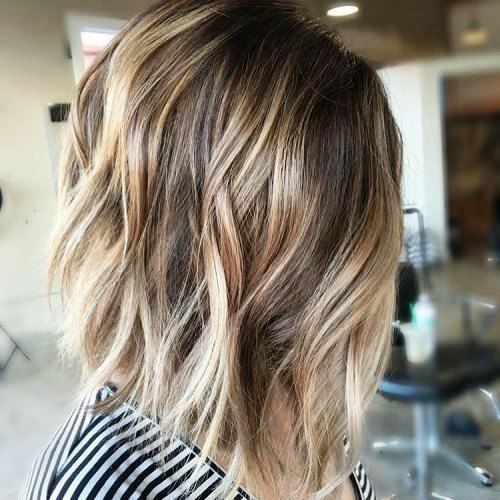 A super gorgeous Medium Bob Hairstyles having sultry waves and Balayage color dye adds an alluring touch to your personality. For sure, it can be easily handled and allows you to get everyone’s attention in an effortless manner. Hence, it makes you rock the upcoming beach party along with some pretty sandals and Capris or one can wear it at a formal event with jewels and an elegant dress. Unable to choose between brunette and blonde highlights? 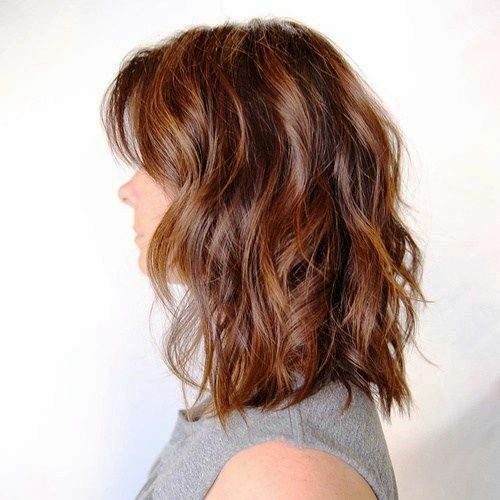 No worries, get your hands on this Bronde Shoulder Length Bob Hairstyles with Layers. 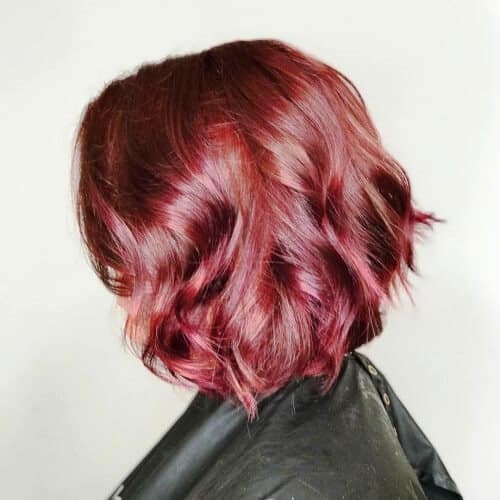 Messy layers blended with a stacked volume on the back side will take this “out-of-the-ordinary” color to a next level. It imparts some class and sass in the basic Medium Hairstyles. 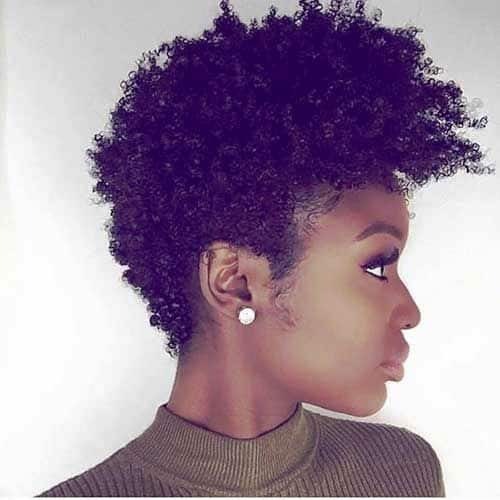 No worries, if you have an oval or a round face, thin or thick hair, curly or straight texture, these Medium Bob Hairstyles have managed to uplift every face and hair type. From elegant to funky, and decent to quirky, there are a number of options to try with your mid length bob hairdo. Additionally, these simple, smooth, stylish haircuts can be worn by women of every age group. A teenager can rock her college prom night, an adult can make her date special, and an elder woman can age gracefully by choosing a right kind of Medium Bob Haircuts. So, just pick the most appealing cut and grab it when you plan to make a next salon appointment!